and served with a frosty pie filled with minty chocolate mousse and ice cream. 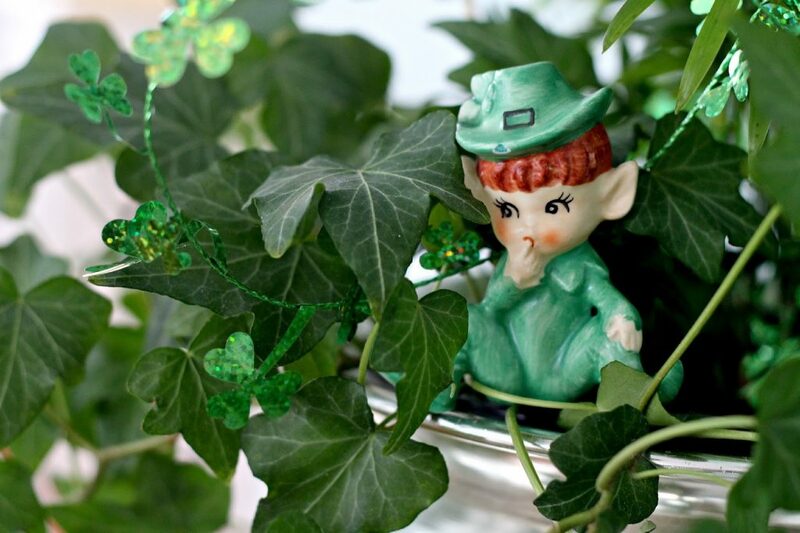 Hidden among the shamrocks, a whimsical, little Leprechaun has been up to some mischief. This wee hooligan is caught poking his finger into his favorite pie. Glittering babbles are a sure sign you have one of these fairy creatures in your midst. So, for this one day in March, don your green fedora and join in his shenanigans. Grab your shillelagh as you partake of his company. leave a comment telling me where it is hiding. Grateful Prayer Thankful Heart.2 (optional) for two additional entries, share this post on your blog, Facebook or Google+ page and let me know you did in another comment. Have your comments sent by the end of this grand day of March 17th, 2014. 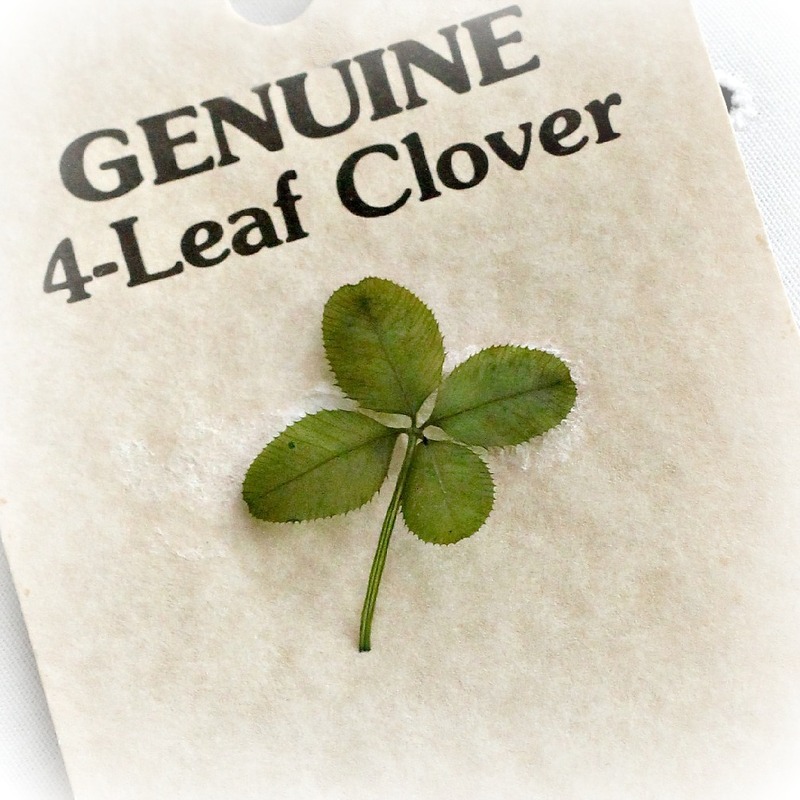 Now go back and find that lucky four-leaf clover! Stir 1/2 cup of Andes mint baking chips into softened ice cream. 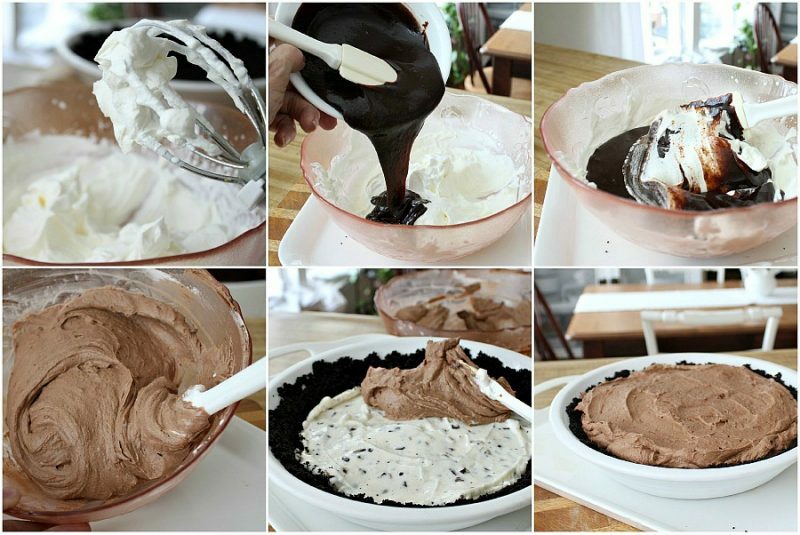 Spread the ice cream mixture onto the bottom of crust; freeze. Melt remaining Andes baking chips with 1/2 cup whipping cream in a saucepan over low heat, stirring constantly. Remove mixture from heat; stir in the egg yolks. Continue heating over medium-low heat for 3-5 minutes or until the mixture begins to thicken, stirring constantly. Do not allow it to boil. Whip the remaining 1 cup of whipping cream until stiff peaks form; fold into the baking chips mixture. 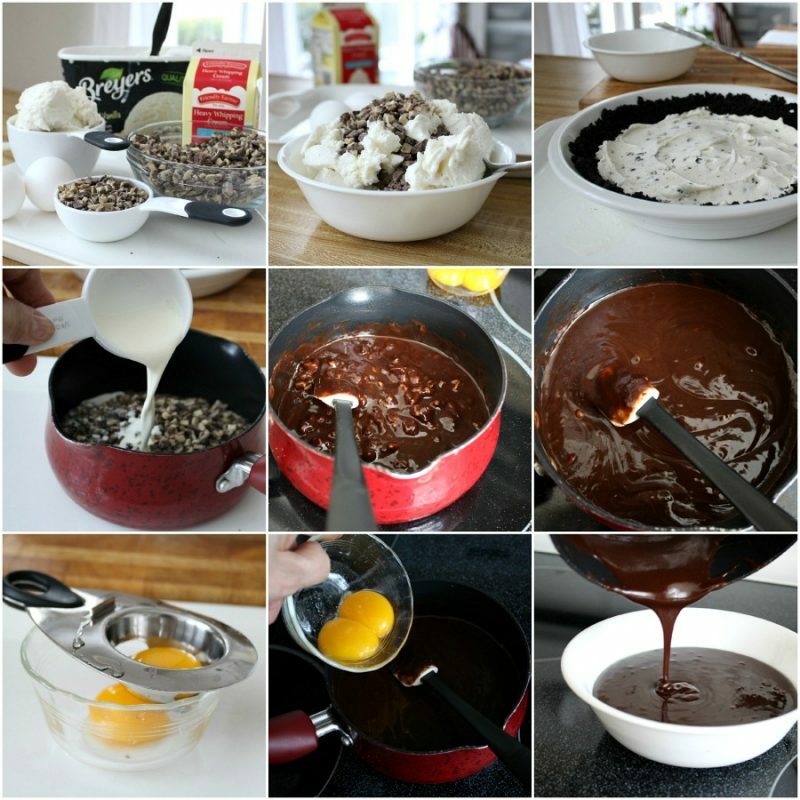 Spread over ice cream in the pie crust. Allow the pie to stand at room temperature for 10-15 minutes before cutting. I also posted your give-a-way on my Facebook page under Debbie Wiles Huffaker! Such beautiful photos and the pie is to die for! How do you manage to make everything look so appetizing? I posted this on my Facebook also! I am not sure if my 2 comments were sent or not. Thank you! I found the 4-leaf clover on the white linen with the green crochet border. That was really a thoughtful gift from your friends on your 10th anniversary, and you have kept it all of these years! I also follow your blog through email-my email address is eatonbbeth@yahoo.com. Thank you! I follow on google+ as Dawn Monroe. 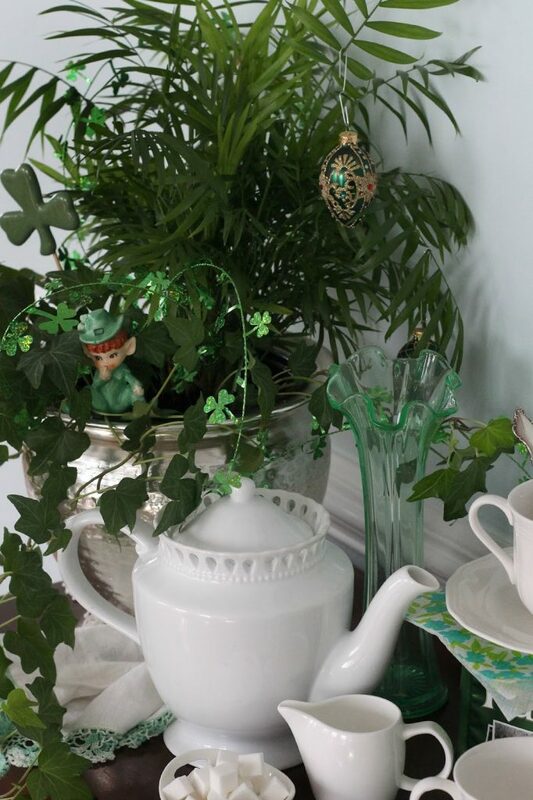 I think I see the clover between the houseplant and the teapot, laying on the white with green lace border cloth. 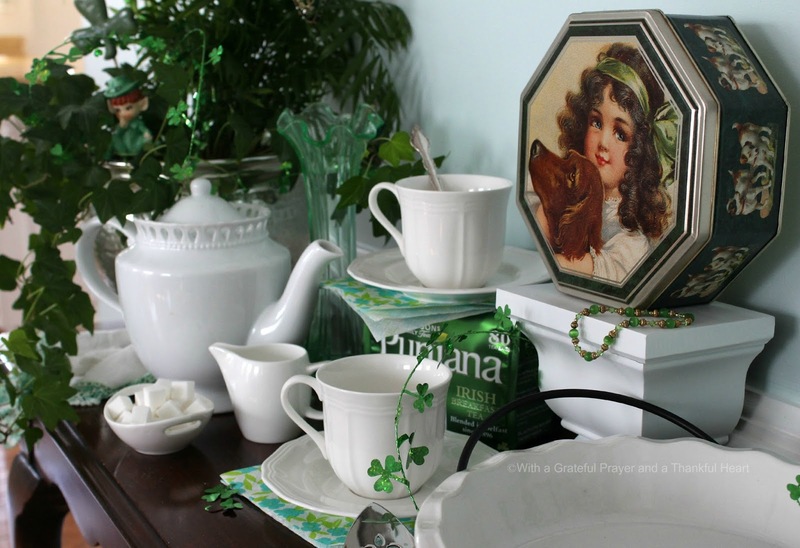 Love this pretty green and white post! So sharp and clear! The pie looks wonderful. 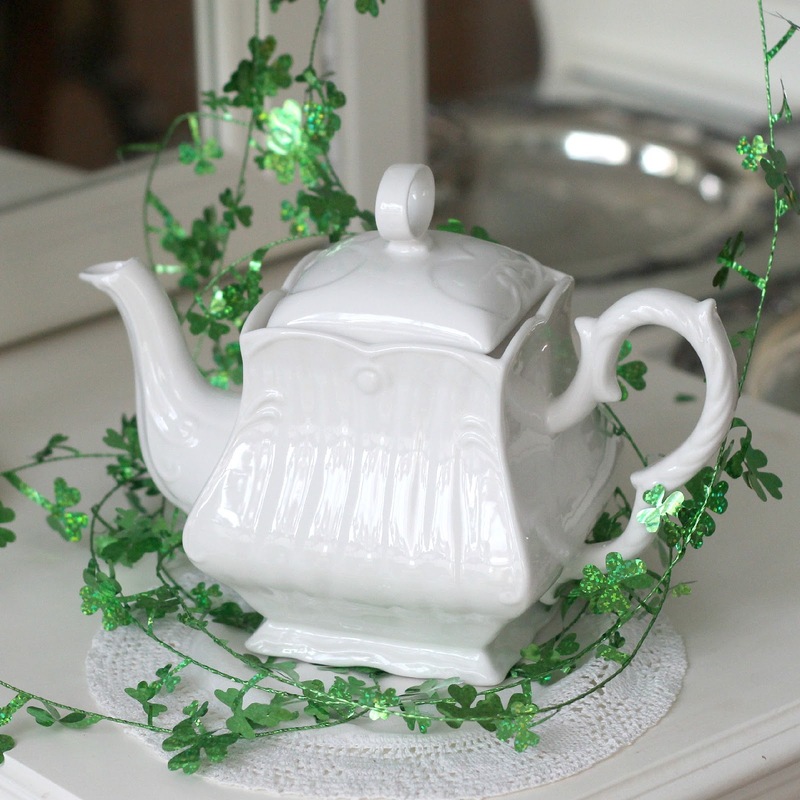 Such a pretty tea pot and a prayer for your mom who had a very lucky bday! I believe I see it on the pretty embroidered edge napkin/hanky beside the beautiful teapot. I am a new reader, having come over from BJ's Sweet Nothings blog. Thamk you!! How gorgeous everything is this setting pretty lady! The pie looks sooo yummy, wish I had a piece this minute!!! Your setting is perfect and so inviting, I am smitten with the two White teapots! Thank you so much for your visit, you did make my day! I think I found it in the 8th photo on the left of the teapot on the cloth with the green embroidery. I have to say I love your St. Patrick's Day decor. How inviting! And I just wish I could stop by your house and visit you in person enjoying all those fabulous goodies. I'm sure your company would be the best part. What a fun St. Patrick's Day post! I saw a 4-leaf clover in the 8th photo down on the left side, resting on the chrochet-edged napkin! I follow you blog by email! I've searched for the four leaf clover, and I have not found it. Thankfully, whenever I search for your blog, I find it and enjoy every single post. This one is another exceptionally well done post! The pie recipe itself, is well worth my visit. Thank you so much for sharing it, and for giving me a St. Patrick's Day greeting. Beautiful! What a cute post! You put a lot of work into it but I can't find the four leaf clover! But I do follow you through blogger. Sorry – forgot to tell you that I am an email subscriber and follower. This was so much fun especially since I am Irish and proud of it. I found the clover in the eighth picture from the top sitting on the beautiful Irish hankie that has the beautiful crochet edging in green and white. The hankie (or is it a napkin) is sitting next to the white tea server. Happy St. Pats day to you. What I would like is a piece of that pie!!! 😉 I'll have to come back later when the headache subsides and take another look for the 4-leaf clover!!! 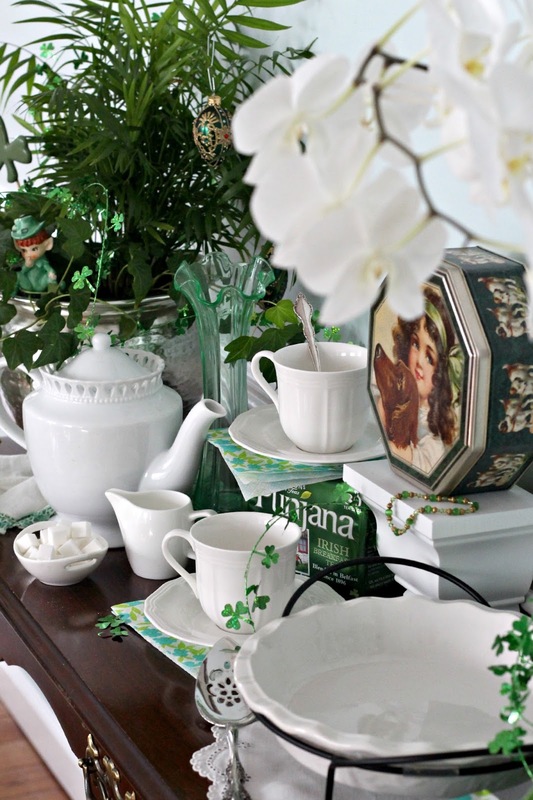 Your St. Patty's tablescape is lovely!! 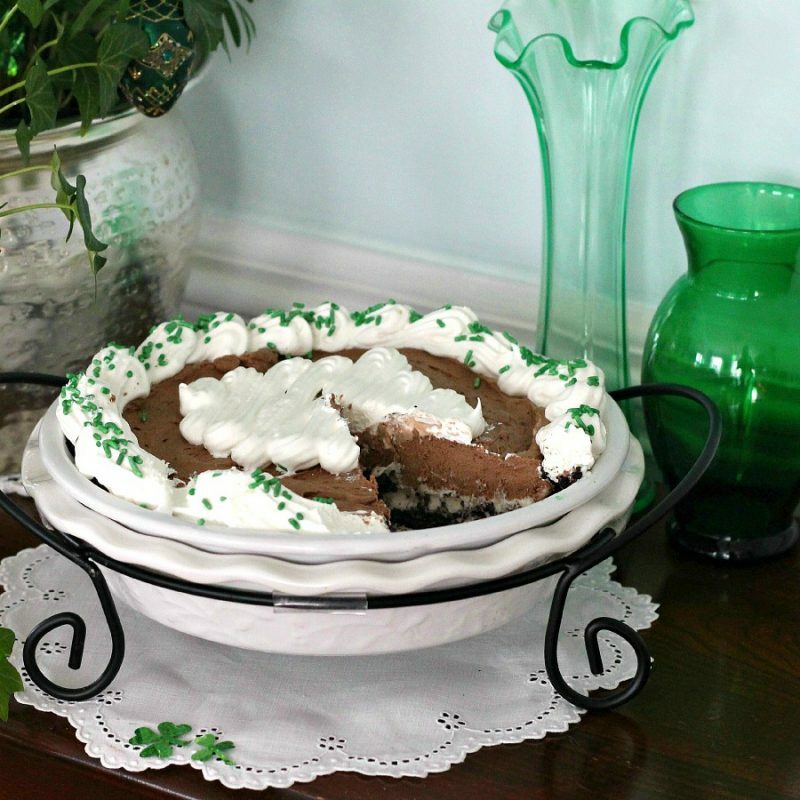 Your minty pie not only looks yummy, but it's easy to make too! 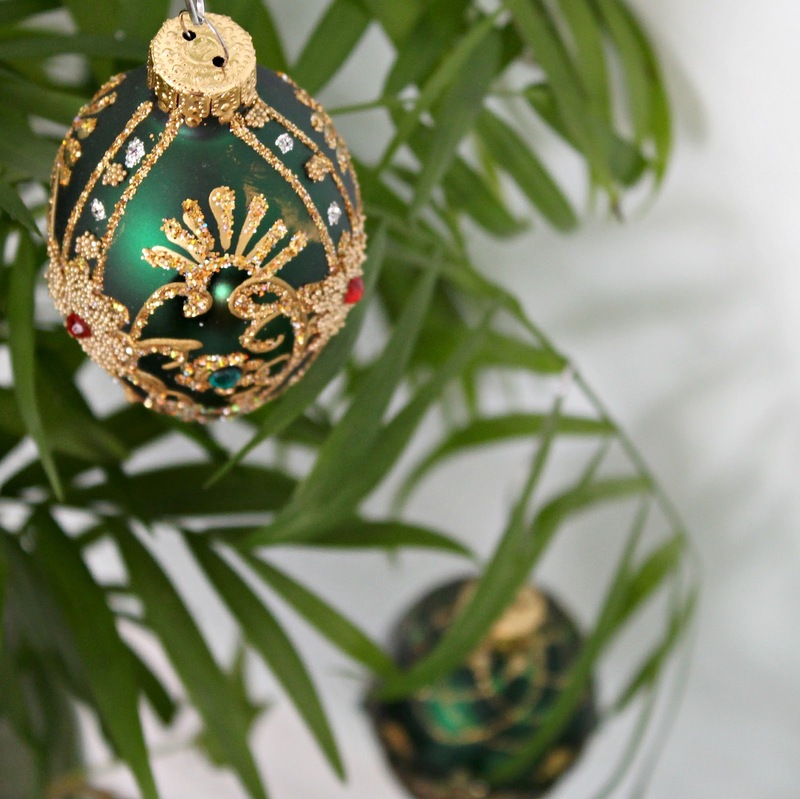 Such fun decorations…..loved your post! What a festive dessert table…I'd like a piece of the pie, for sure! It looks like it's sitting there in between the pot of orchids and the green vase. Oh that pie looks good! I love just about anything with mint! I found the shamrock under your beautiful white teapot with the ivy. I love your blog. Thanks for the chance to win. 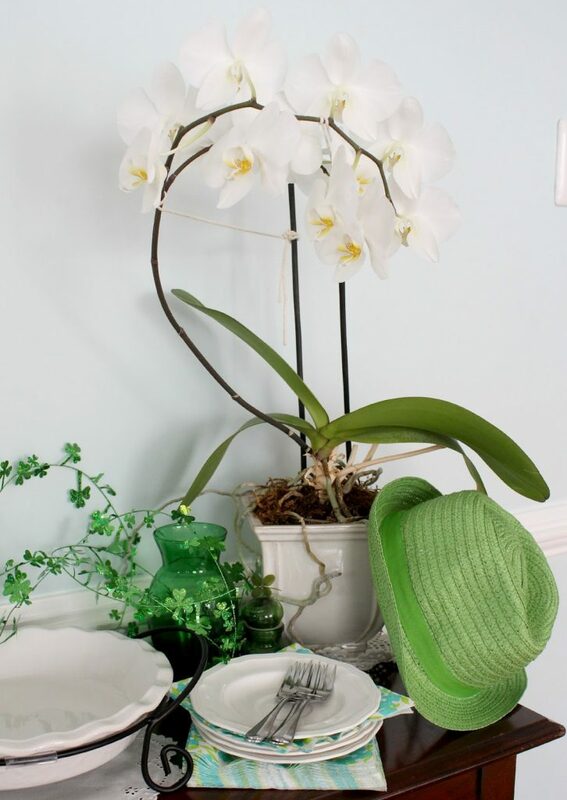 I think I seen the 4 leaf clover in the picture with the green hat….on top of the little green vase??? PS.. I can't get enough of your blog. So classy. Good morning ~ What a pretty post and that pie looks so scrumptious. Photo number 8 on the cloth with green and white crocheted edging. What a lovely gift for whoever wins. I am a follower through Blogger. Oh sorry…I didn't answer the question of how do I follow your blog…well I don't know lol All I do know is that your blog is part of my bookmarks and having been following for a long time. I probably found it while looking at recipes. Anyway, I loveeeeee your blog! and I read it daily. Oh sorry I forgot to add how I follow your blog…actually I don't know lol I simply have your blog on my bookmarks and look at it daily. Beautiful tea setting…that pie looks great. Lovely teapot! 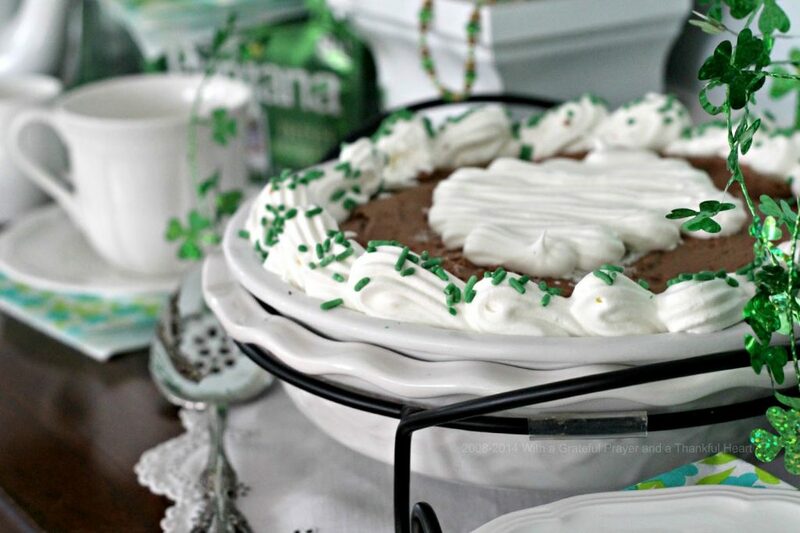 the four leaf clover is on the photo under this caption…grab your shillelagh as you partake of his company…on the pretty white and green table napkin. I spy a green four leaf clover by the green edging on the napkin! I see the four-leaf closer by the cup and saucer near the teapot! Such a fun setting – and a yummy-sounding dessert delight! I spy it just to the left of that pretty teapot, sitting there on the gorgeous linen with the green crochet work. I'd be thrilled to be the winner of this lovely tea pot. Love the shape! I'll put your giveaway on my sidebar. This may be my second comment(didn't mean too). I follow your blog on Feedly. I so enjoy your posts – mostly your inspiration. This may be the cutest table I have ever seen. 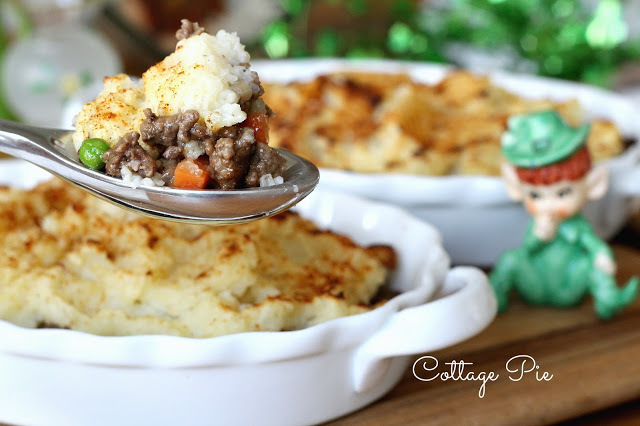 Sew cute and very Irish. The four leaf clover is in the 8th picture on the table scarf by the ivy. I have to admit – I was a little excited to find it! I have never found a four leaf clover in my life. Such a cute idea – and a wonderful tribute to your Mother. Thanks for sharing a little of your Irish charm. Erin (yes this is my real name – not an Irish joke). This may be the cutest table I have ever seen. So sweet! 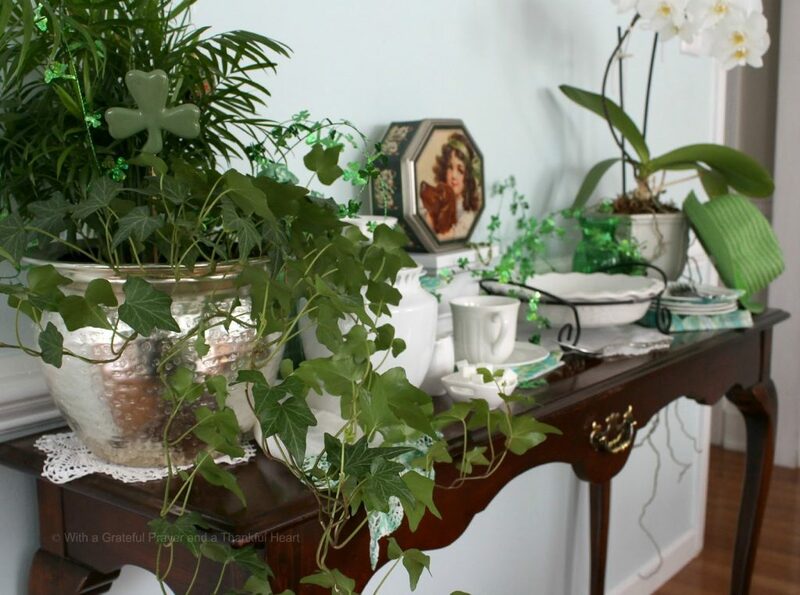 The four leave clover is hidden on the white table scarf under the ivy (in the 8th picture down). Thank you for sharing a little of your Irish charm. Mmmm the dessert looks so good! Your presentation on the buffet looks marvelous! That's an adorable leprechaun even if he did steal some pie! Have a Happy St. Patrick's Day! What a fun post and of course I had to try and find the 4 leaf clover. I think I see it in the 8th picture down laying on the linen with the crocheted edging. I am a new follower of google friend connect. Still looking for four leaf clover. 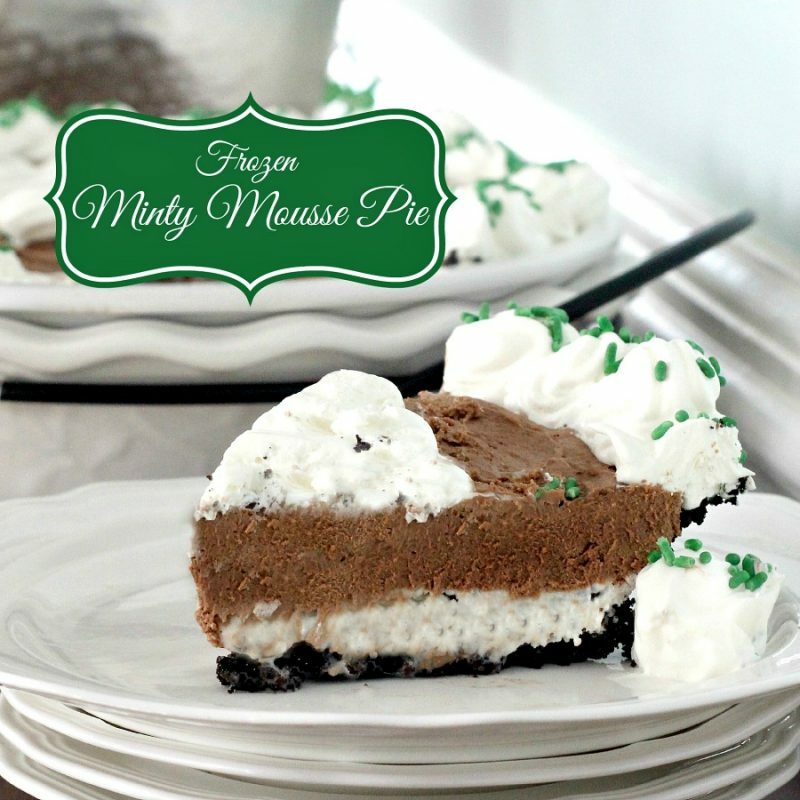 You had me a minty mousse pie! Everything looks lovely! 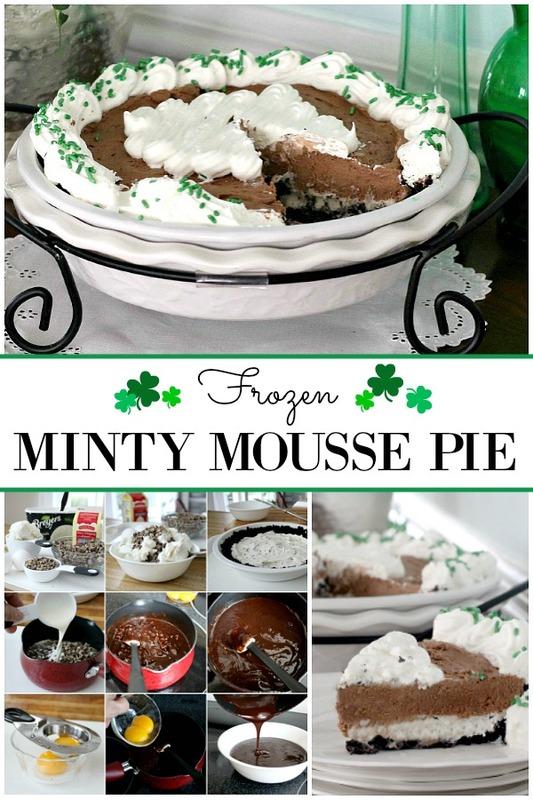 I am drooling over the minty mousse pie. Looks delicious and hard to resist. I could go for that cup of Irish coffee too. Your Irish buffet is pretty. I can't see the four leaf clover! I'll keep looking. what gorgeous St. Paddy's decor, Lorraine! i do believe I spy a 4 leaf clove resting on the lovely napkin, with the beautiful crocheted edging, next to the silver pot. xo! P.S. meant to type clover! 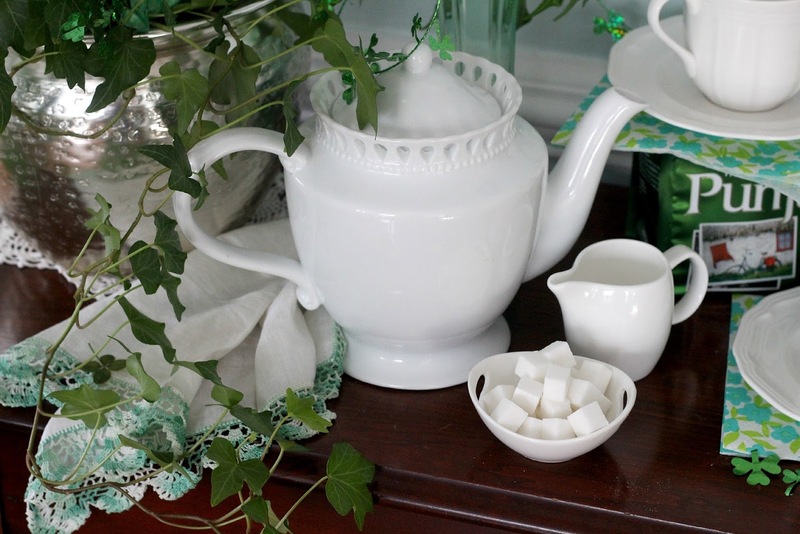 Funny, I too, will be having a giveaway for my 3rd blogaversary, and the star is……a white teapot!